Email us your booking at venusbeautysalon@aol.com if you prefer. If you do not cancel an appointment the day before you will need to pay the full amount. No future appointment may be booked untill the bill is settled as we have a waiting list for treatments. Please note: We accept payments through PayPal for Gift Vouchers online. We also now accept card payments in both of our salons, but cannot take card payments over the phone. If you wish to prepay book a voucher on our website and pay via PayPal. Thank you. Damaged cuticles clipped and pushed back, nails shaped properly, buffed to a shine and polished with the colour of your choice . Please allow an extra 10 - 20 minutes drying time for this treatment. Sometimes men need manicures, especially if they bite their nails. Go on try it. Damaged cuticles clipped and pushed back, nails shaped properly, buffed to a shine and polished with the colour of your choice. We then apply a french polish (white tip painted on with base and top coat). Are you tired of chipping, flaking or smudging nail polishes? Are your nails weak and bendy? 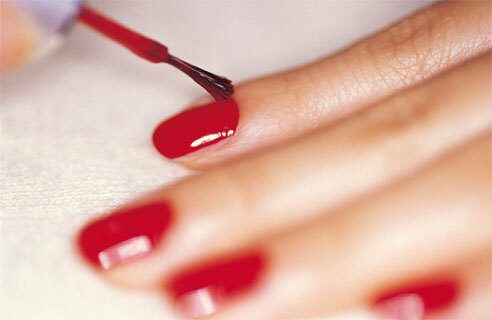 A SHELLAC MANICURE is a gel overlay which can be painted onto your finger or toe nails like a polish. SHELLAC doesn't chip, flake or peel like a normal polish and can last up to 3 weeks, maintaining a high gloss shine. SHELLAC is ideal for strengthening weak nails and enabling them to grow. It does not damaged the natural nail if removed properly. 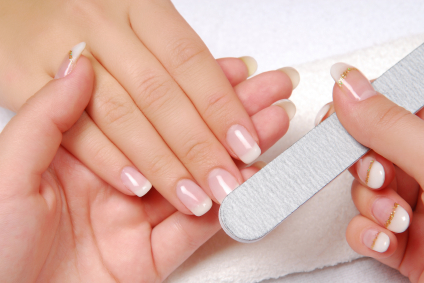 SHELLAC can be removed in-salon by a professional in under 10 minutes, costing only £5. 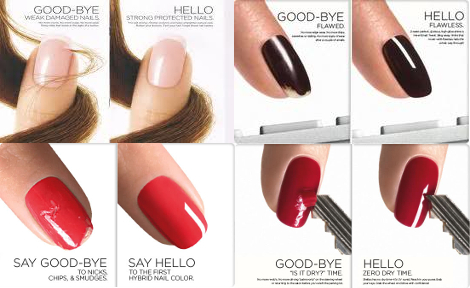 A SHELLAC MANICURE includes nail shaping & filing, cuticle work, nail prep and tidy and the SHELLAC application. Gelish will last around 3 weeks without chipping, flaking or damaging your nails. In that time it will maintain a high gloss shine. Gelish manicures are almost identical to normal manicures, but the polish contains a plastic molecule that stays intact once it's been 'cured' under a UV light. It's removed using pure acetone after three weeks without damaging the natural nail. 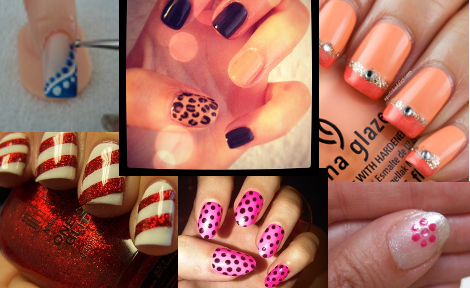 Gel is a modern alternative to powders and liquids, gel nails offer exceptional design versatility and high shine. Can be used with an extension to your own nails or as an overlay to strengthen your nails. If your unsure which nail treatment would be best suited to you then please do not hesitate to contact us and ask one of our beauty therapists. 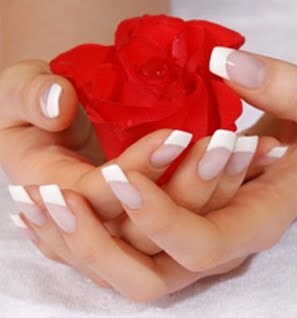 We also do Acrylic Nail Extensions so you can choose which you would prefer. Treatment Time: 1-2.5 hrs approx. 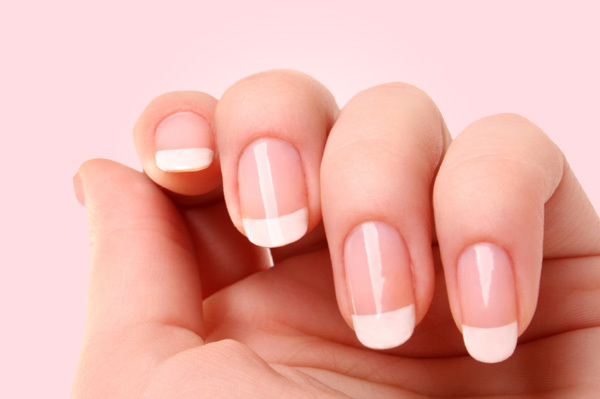 White tips are applied to natural nails to create the "French" look. Acrylic is then applied over the entire nail to give a natural, clean and extremely robust finish. Last up to 2 weeks before needing an in-fill. These nails are very strong and hard-wearing but if you do, however, happen to have a breakage we can fix it up like new for you at a cost of £2 per nail. 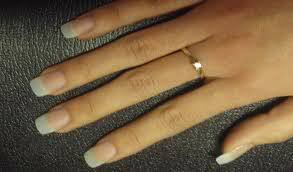 Natural clear tips applied to the nails to extend the length of your nail without looking false. Can be left natural as above or painted to the colour of your choice. In-fills after 2-3 weeks extensions. Includes cuticle work, filing down, buffing, re-polish, and up to 5 complete new repairs. Nails filed, buffed and polished only. No cuticle work or massage. Nails filed, buffed and polished only. No cuticle work, soak or massage. Extreme pampering, soak in massaging footspa, specially prepared peppermint exfoliation, peppermint foot mask, peppermint massage, hard skin buffed, cuticle work, nails filed, buffed and polished with colour of choice. Please allow an extra 10 - 20 minutes drying time for this treatment unless it is shellac which dries instantly and does not smudge. For pedi-treatments please wear sandals or loose fitting shoes to avoid undue pressure on newly painted toenails. 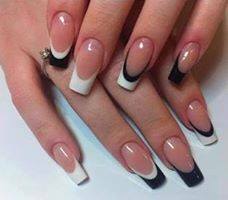 For badly bitten nails that can't take acrylic nail extensions artificial or express nails can be applied to the whole nail down to cuticle, these will last approximately 5-10 days. 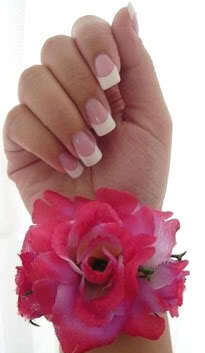 They are ideal for a quick fix when going to a wedding, holiday or special occasions. Nail art is priced according to design. You may take your own design into us, tell us what you'd like or even choose from our sample designs. Priced per nail according to design. This is a long lasting natural overall tan which lasts up to two weeks. £35 full body or £25 half body. Very popular. A permanent end to superfluous hair on face, neck, chin, hairline etc. A proven method of permanent hair removal electrolysis involves the insertion of a very fine probe into the hair follicle—a mild current is passed through this to cauterise the hair root to prevent further growth. Disposable probes and lignocaine surface anaesthetic applied. Honey based wax removes hair quickly and gently with disposable linen strips. Lessens re-growth and makes it softer in appearance - can take 3-6 weeks to fully re-grow. All Bikini Waxing includes inner thighs. A relaxing and comforting treatment with fantastic results. The French Anesi products leave the skin feeling pure, protected, fully hydrated and deeply cleansed. Treatment includes steam, gauze mask, product mask, tone, moisturise and penetrative massage. This very popular treatment gives excellent results immediately, but with a course and with regular monthly sessions the effects are maintained to keep the skin fresh and hold off the signs of aging. The electro-stimulation combats lines and wrinkles. The electronic way to smooth out fine line and lift tired skin. Harmless and relaxing the electro-therapy speeds up the circulation of the natural micro-currents in your skin and stimulates any sagging areas into action. Click on pictures opposite to enlarge and view. Makes an excellent gift in the form of a voucher. This is one of Maxine's and Liz's favourite facial treatments. Go ahead and Google CACI, see what they say, you will be amazed. This superficial blood condition appears as visible small thin veins that lie just beneath the surface of the skin. 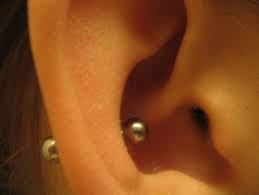 They occur on the face and body and can build up over many years or appear due to sudden damage to the skin. Blood spots presented as tiny red marks on the skin are also common and can increase with age. Spider veins (Spider Naevus) are tiny capillaries radiating from a red mark which look like spiders legs hence the name! Treatment instantly coagulates the trapped blood as gentle heat works though the vein. The vein is cauterised at both ends preventing it refilling, making this treatment highly successful. Red veins can be hereditary however they can also appear due to neglect of the skin such as use of sunbeds/sunbathing, extremes of temperature, smoking. They may also be caused by trauma to the skin, excess weight and pregnancy. 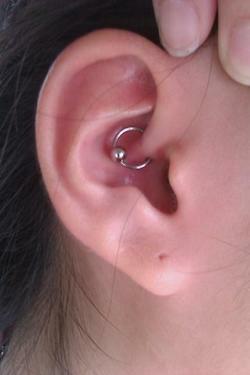 Each treatment takes approximately 15 minutes and generally several treatments are required to improve the area. 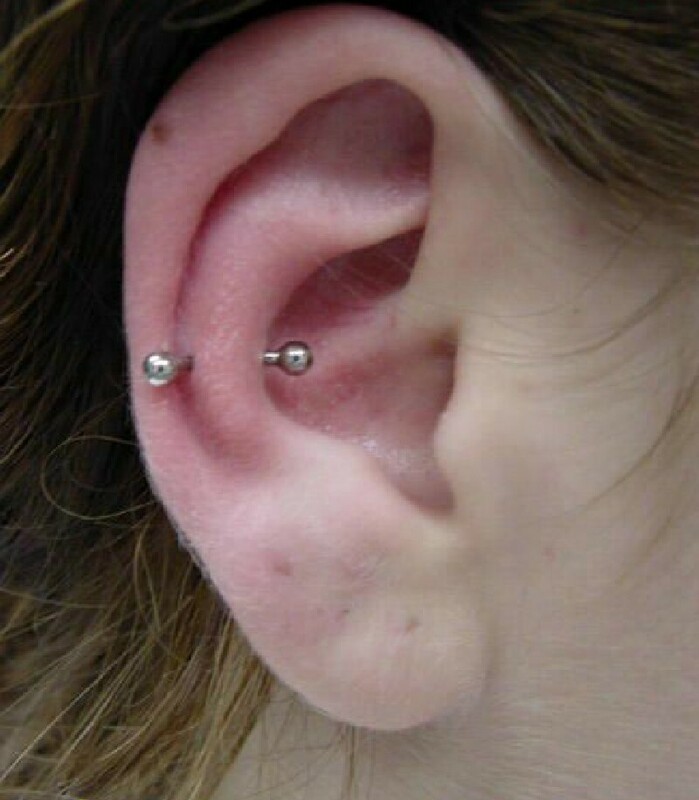 Intervals of 2 weeks between treatments are required to allow the skin to rest between treatments. Although you way initially assume total clearance of red veins is the desired outcome, many clients find that once the more visible veins are removed they are much happier with the appearance of their skin and often don't require total clearance. After each treatment the area will be red for the rest of the day. 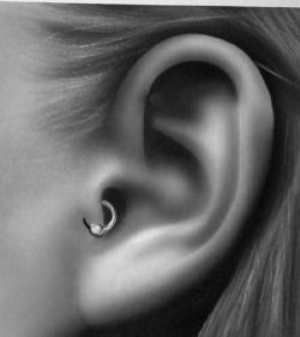 For the next few days some clients do experience tiny crusts (dot size) however this is so slight and hardly noticeable. In the case of a larger area needing treatment, Intense Pulsed Light treatment can be applied. Both treatments can be combined with IPL treating the large area initially and then finishing of with precision work on individual veins. 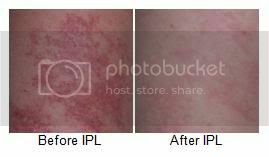 IPL is an advanced non-evasive treatment which can eliminate these unsightly blemishes without injections or surgery. The energy from the intense pulse light coagulates the blood in the vein, causing it to become redundant and eventually disappears. The duration and number of treatments varies depending on the area to be covered and type of lesions requiring treatment. Therefore a treatment plan is developed with your red vein specialist. Cost of treatment is from £35 per 15 minutes and this will be discussed at your initial consultation along with treatment options and expected results. A skin tag is a common skin growth that looks like a small piece of hanging skin. 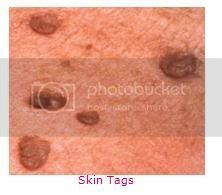 Skin tags are often described as bits of skin- or flesh-coloured tissue that projects from the surrounding skin from a small, narrow stalk. They typically occur on the neck, underarms, eyelids, and under the breasts (especially where under-wire bras rub directly beneath the breasts). Although skin tags may vary somewhat in appearance, they are usually smooth or slightly wrinkled and irregular, flesh-coloured or slightly more brown, and hang from the skin by a small stalk. Skin Tags may be as small as a flattened pinpoint-sized bump around the neck. Although tags may occur in anyone, more often they arise in adulthood. They are much more common in middle age and they tend to increase in prevalence up to age 60. Skin tags are removed by passing a probe into them which has heat passing through it. This will seal off the blood supply and prevent the tag developing. Often the tag is completely removed with the first treatment. 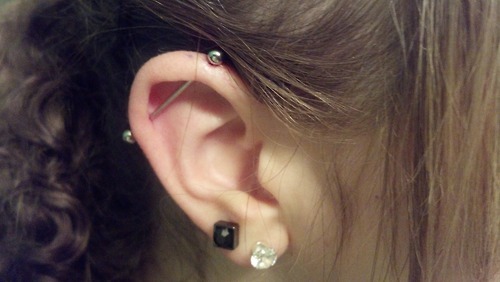 Someof the smaller ones will be completely removed with the first treatment. Larger tags may require 2 - 3 treatments. After the treatment a small scab will form in the site of the tag. 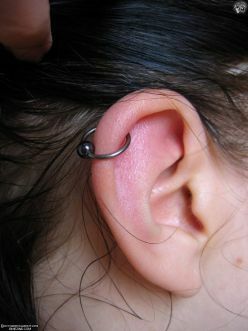 This is part of the normal healing process and will gradually disappear over the following few days. In some cases this can take up to 2 weeks. Cost is £25-45 depending on amount of work to do and areas on body. Available in only our Fort William salonsat all times. Please note Venus has a policy of only treating women due to privacy and health and safety issues. We hope you understand and do not try to book for any gentlemen. 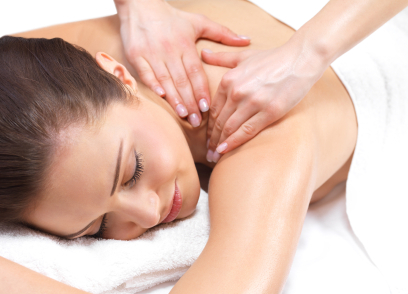 This is one of the most relaxing and luxurious treatments of all on offer and can aid a muscle strain or simply ease away the cares of the day. Have your eyelashes tinted black, blue/black or brown. Great for holidays or swimming. Lasts upto 6 weeks. Patch testing is recommended if you've never used dye before. Pop into one of our salons for a patch test. Have your eyebrows tinted light/dark brown or grey, helps definition and is the modern trend. Helps with overly plucked eyebrows to bring back the shape effect. 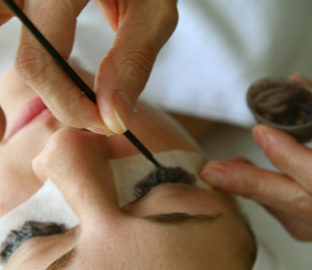 Bleach the fine dark hairs on upper lip instead of waxing, lasts about 3-4 weeks. 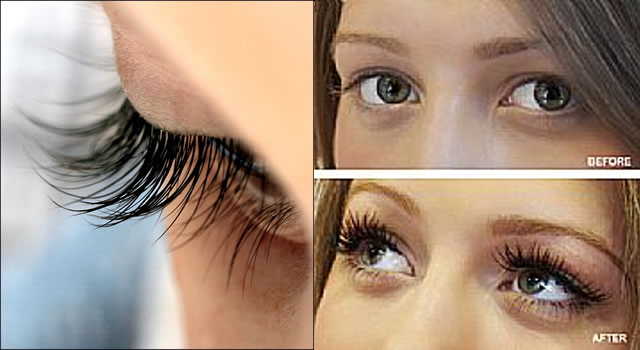 Leaves eyelashes full, noticeable and gives your eyes an added dimension. This is one eye treatment that makes a fantastic difference to your eyelashes, not only are they dramatically curled without having to bother with eyelash curlers every day, but they are also darkened with either Black, Blue-Black or Brown eyelash dye. Makes a real difference and look spectacular for photos. ...is the most important day of your life. Make your day memorable for all the right reasons at Venus Beauty Salon. We keep our prices reasonable in order to suit your budget. Please click on the pictures as the side to enlarge them to see the amazing Before and After pics. Prices for Make-up are below..
Home/Hotel - Group bookings are £30 per person. The venue must be within 30 miles of nearest salon. Otherwise ask for price. We offer a pre-wedding make-up session at our salons which will show brides-to-be how they will look on their big day. This is great for providing piece of mind. You may wish to book a practice pre-wedding make up session or just go ahead and have us do it on the day. We are professionals with many years' experience and will check with you every step of the way that you are happy. We use special French products in our facials and cleansing routines called Anesi but in the Make Over treatments we use mostly High Street retail products which are tried and tested and suit most tastes and are available to clients to purchase readily should they like the look that we create. Come to us, or we can come to you..
We are happy to come to your venue if you are within a reasonable travel distance of one of our salons, but we do charge the cost of fuel plus an amount for the time taken to travel to and from the venue and the salon, so if you can get into the salon for your wedding day appointment it will save you money. Please call any of our 3 Salons or send us an email (contact details below) for an appointment or if you have any further questions about a quotation or availability just ask! We do, however, ask for a 50% deposit a month before your wedding day in order for us to secure your appointment. 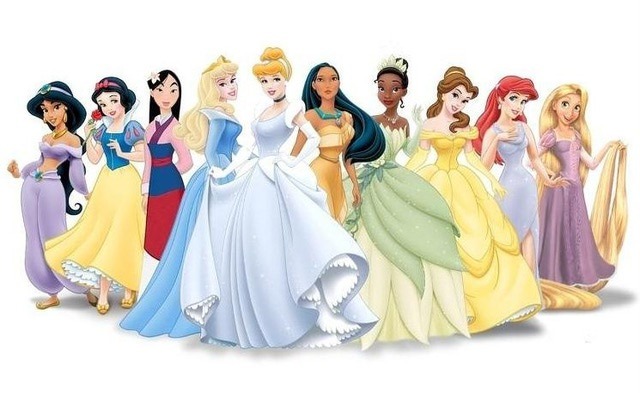 Why not treat your little princess on her next birthday? by arrangement in our own salons. Venue should be within 25 miles of salon or extra mileage charged. Just ask us about booking this at the salon. It can be fun. Popular Megasun 3000 Sunbed lie down and enjoy whilst you tan in comfort. £2.50 for 3 mins, £4.50 for 6 mins, £6.50 for 9 mins, £8,50 for 12 mins.